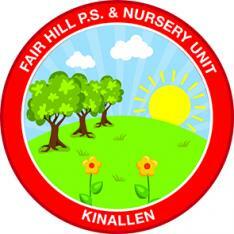 It is my great privilege to be the principal of Fair Hill PS. We are a busy but friendly school, with lots going on. This website aims to give you a taster of the school, as well as providing regular updates information for both parents and pupils. The school has a strong Christian ethos and our primary aim is to provide a caring and stimulating environment within which each child will be valued and nurtured, in order to reach his/her potential. We wish to promote in all our pupils, such values that will make them caring and responsible citizens. We believe in the dignity and worth of each individual and in the development of the whole person. To do this effectively, we at Fair Hill place great value on relationships and the teamwork between pupils, parents, teachers and governors. We believe that when working together, we can provide the best possible educational opportunities, thus ensuring that every child reaches their potential. The school communicates regularly with parents via the website, newsletters, parent/teacher meetings, PSG meetings and various school based activities. We also employ an open door policy to ensure urgent parental queries are dealt with quickly and effectively by the most relevant member of staff. We hope you enjoy your visit to the web site and that you find the information you are searching for.